It is tough to predict each year how long the spring fishing season will be and when there will be open water on the Rainy River. After all, only Mother Nature really knows when the river will open up. The one thing we do know for sure is when the spring walleye season closes. The spring walleye season on the Rainy River and Four Mile Bay runs from March 1st through April 14th. This year, despite frigid winter temps plunging to 40 below zero, the Rainy River opened up last week as predicted. There has been a good amount of current all winter long that prevented super thick ice on the river and certainly helped things along this spring. As every year, it started with some brave (some would say crazy) anglers pushing their boats over shoreline ice only to find the open flowing waters of the Rainy River. We don’t recommend or encourage this, but it does happen. Not too much longer after the first few boats were spotted on the river, the first boat ramp was open to boats on trailers. Nelson Park in Birchdale opened up this past Thursday, March 28th. Since then, anglers have been out targeting big walleyes in the Rainy River. Currently, there are two boat ramps confirmed opened up and a third reported open thanks to the help of some angler’s prop wash! With boat ramps open, as you can imagine, anglers are taking advantage of the open water on the Rainy River. Currently, Nelson Park in Birchdale and the Frontier boat ramp are confirmed open. Vidas (near Clementson) is unofficially reported open now as well. Most anglers this time of year are jigging. Traditionally, a jig and minnow is the go to method. Live minnows such as a fat head, chub or small sucker minnow is the choice of some. Others swear by using frozen emerald shiners, which is a staple food source of walleyes on Lake of the Woods and in the Rainy River. Some anglers break out their plastics this time of year. A jig tipped with a plastic can be just what the walleyes ordered. With the wide variety of plastics on the market, anglers can play around with size, shape, texture, scent and color. There is nothing like the feeling of seeing a big walleye emerge from the depths with a jig and colorful plastic in it’s mouth. Rainy River Walleye near Lake of the Woods with Greg Jones and Joe Henry. Another overlooked technique that puts a lot of big walleyes in the boat is trolling crankbaits. Yes, the water is cold. However, slowly pulling a shad rap or your favorite crank against the current can be the ticket. By pulling against the current, you can go slower which can be important in this ice cold water. With water flowing against your crank, you still get great action without the speed. Big walleyes are being boated. Images across social media show why anglers come to the Rainy River this time of year. The chance to catch dozens of nice walleyes. The chance at a fish of a lifetime. The opportunity to still be fishing walleyes. The opportunity to fish open water which for many is the first time in 2019. There are many reasons anglers flock to the Rainy River this time of year. Another reason anglers come up to the Rainy River in the spring is sturgeon. There is a growing group of anglers who actually leave the walleye anglers alone and focus on the dinosaurs. Lake sturgeon have made a wonderful comeback on Lake of the Woods and the Rainy River. With no more commercial netting on Lake of the Woods and the insertion of the clean water act which cleaned up the Rainy River, the sturgeon’s main spawning grounds, the population of sturgeon and the size of sturgeon have exploded. Sturgeon fishing is very relaxing. Typically, anglers will find a deep hole in the river and anchor up. Using heavier tackle, the go to bait is a sturgeon rig combined with nightcrawlers and in some cases, even frozen shiners on a big circle hook. This rig is fished on the bottom as sturgeon typically are bottom feeders. When you hook into one, you will know it! 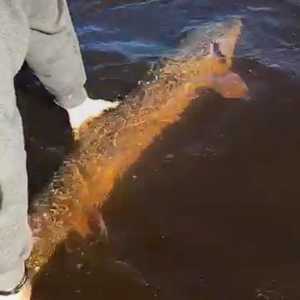 A lot of big sturgeon have already been caught on the Rainy River this past week. Some caught by sturgeon anglers, others by unsuspecting walleye anglers using live bait. Spring is a wonderful time of the year. It’s also a wonderful opportunity to fish on the Rainy River. With various boat ramps and a good stretch of the Rainy River opened up, traffic at access points gets dispersed which is nice vs having only one access open. The upcoming week’s weather forecast is beautiful and some anglers will take advantage of this short but very special season. Now is the time!